Habitat: Desert, Upland. 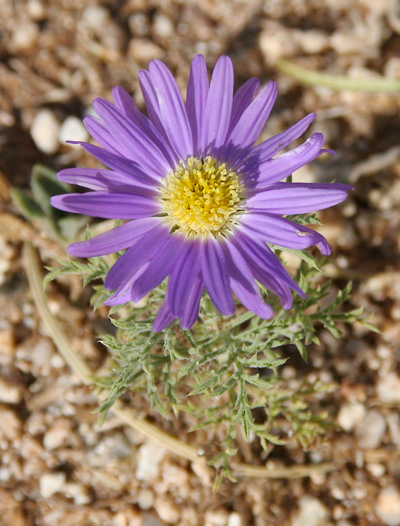 This wildflower grows in sandy soil in sunny, open, disturbed areas. Description: The 2 inch (5 cm) wide flower heads have numerous purple rays with white at the base, yellow disks, and spreading, reflexed, or sometimes appressed phyllaries (bracts at the base of the flower heads) in 3 to 6 series and with green, glandular-hairy tips. The flower heads are followed by tawny, bristly, rounded seed heads. The fernlike or tansy-like leaves are grayish green, sticky, glandular-hairy, alternate, and once or twice pinnatifid with spiny tips. The stems are branched, glandular-hairy, green near the top of the plant, and pinkish near the base. The similar Arida parviflora (Machaeranthera parviflora) sometimes has twice pinnatifid leaves, but it has smaller flower heads and its coarser leaves are not tipped with sharp spines. Arida arizonica (Machaeranthera arida), Arida parviflora (Machaeranthera parviflora), and Machaeranthera tagetina have only once pinnatifid leaves. 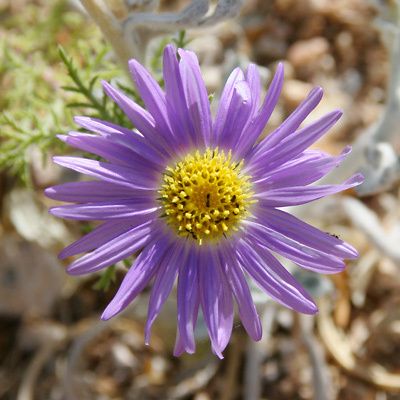 Almutaster pauciflorus (Aster pauciflorus), Arida riparia (Machaeranthera riparia), Dieteria asteroides (Machaeranthera asteroides), Dieteria bigelovii (Machaeranthera bigelovii), Dieteria canescens (Machaeranthera canescens), Psilactis asteroides, and Psilactis gentryi all have non-pinnatifid leaves.